It's been a year-and-a-half since Metric released their most recent LP, Fantasies, but the Toronto, ON indie rock new wavers are still wrapped up in the promotional cycle. They recently recruited their fans for a new full-album remix project and are about to head out on the road, opening up for Muse. 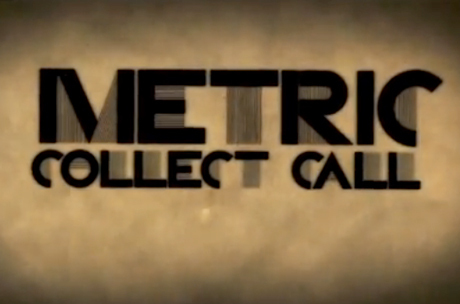 Now, they have unveiled their latest piece of Fantasies promotion: an "animated short film" by music video director Christopher Mills (Modest Mouse, Interpol, Broken Social Scene) for "Collect Call." The video was unveiled last weekend at the Bravo!FACT Shorts Under the Stars screening in Toronto. Despite the band dubbing this an "animated short film," it's really just a music video. See for yourself below.